The all-new Power Bar is a special menu of admin controls to edit your website and preview changes instantly. It has all the functionality of the old “Edit Mode”, with one key difference. The Power Bar is a separate menu – it no longer replaces your website's main menu. 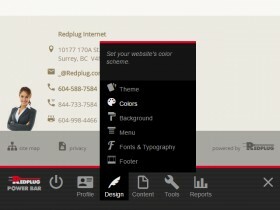 This allows you to view and edit your website in the same session, without having to switch modes, login or logout. View your website by clicking a main menu or other link. Edit your website by clicking a Power Bar link at the bottom of the screen. The Power Bar menu can be turned on by clicking the Power Bar logo at the bottom right of the page. The new Power Bar makes editing your website easier than ever!